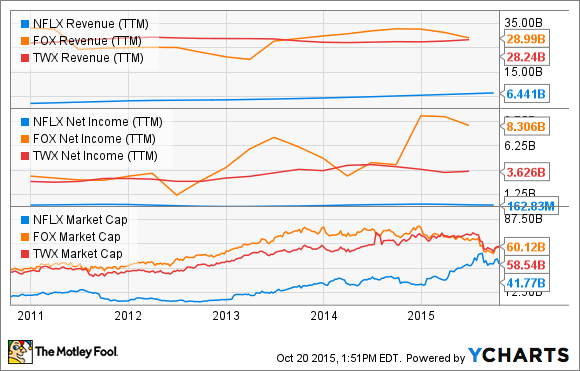 Can Netflix Live Up to Its Lofty Valuation? How many subscribers does Netflix need to live up to the market's expectations? Netflix (NASDAQ:NFLX) is worth $42 billion as I'm writing, something I'm having a hard time getting my head around. How can a company that is a middleman in content distribution worth nearly as much as content owners like Time Warner (NYSE:TWX.DL) and Twenty-First Century Fox (NASDAQ:FOX), who have much more revenue, more profit, and well established businesses? NFLX Revenue (TTM) data by YCharts. The reason Netflix is worth so much is that investors have assumed it will be a growth machine for years to come, disrupting businesses like Time Warner and Fox. But to give investors an idea of how far Netflix has to go, let's work backward from the profit levels I think Neflix will eventually have to reach. To provide a baseline, I think we should be able to see a way Netflix can reach the valuation metrics of its big competitors. As an example, both Time Warner and Fox trade for 13 times next year's earnings estimates. Since they're both content companies with streaming arms and mature businesses, they're probably a good proxy for where Netflix will have to get someday. Netflix's current market cap of $42 billion, then, means that eventually, it will have to make $3.2 billion in annual profit to trade at a comparable forward earnings multiple. To back into revenue required to reach that figure, we have to make some assumptions about future net margins. If we assume an annualized contribution profit for international operations of 30% (similar to domestic margins), constant "other operating expenses" and "other income (expense)," and a tax rate of 30%, we get a net margin of 10.7%. That means to have $3.2 billion in net income, Netflix would have to generate $30.0 billion in revenue. Seems easy enough given projected 2015 revenue of $6.1 billion and a current growth rate of nearly 30%, but Netflix may need more than new subscribers to reach the market's lofty expectations. How many subscribers does Netflix need? In the U.S., Netflix's average subscriber paid $8.21 per month last quarter. That's due to rise $1 per month over the next year, and a standard plan will be $9.99 per month. With that increase already in the works, let's assume an average subscription fee of a round $10 per month per subscriber. Or $120 per subscriber, per year. That means Netflix would have to attract 250 million subscribers to live up to its market value, assuming it keeps subscription prices at $10 per month and meets the margin targets I outlined above. To put that into perspective, almost 1 in every 5 households in the world would have to subscribe to Netflix. None of this analysis is to suggest that Netflix stock isn't going to go up, or that the company won't adapt and change in the future. I'm simply trying to put the company's current market value into context versus competitors given Netflix's current business model. To live up to the market's valuation, the company will likely have to push through a lot more price increases and still grow its subscriber base at a rapid rate, all while holding off competition from content studios. Can it do all of that? That's something to think about.